When I first started this blog over a year ago, one of my first book reviews was of Becoming Bonnie by Jenni L. Walsh. I. Loved. Her. Book. At the time, I reached out to her via Instagram to tell her how much I enjoyed it and asked her to keep me in mind when her next book came out. A year later, here we are! 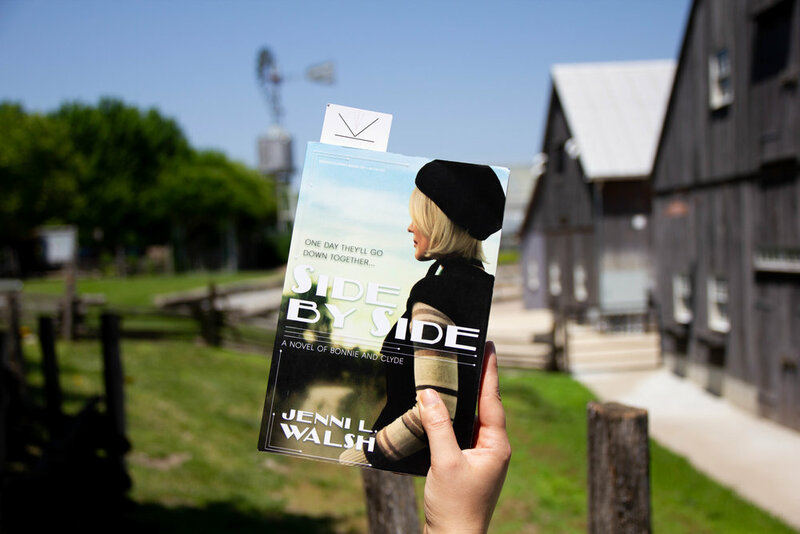 She sent me a copy of the second book, Side by Side, and I actually liked this one even more...which is unusual, because as a rule sequels are never as good as the original. Right? But not only did she send me an early review copy, she also agreed to a Q&A so check back on Thursday to hear more from Jenni. 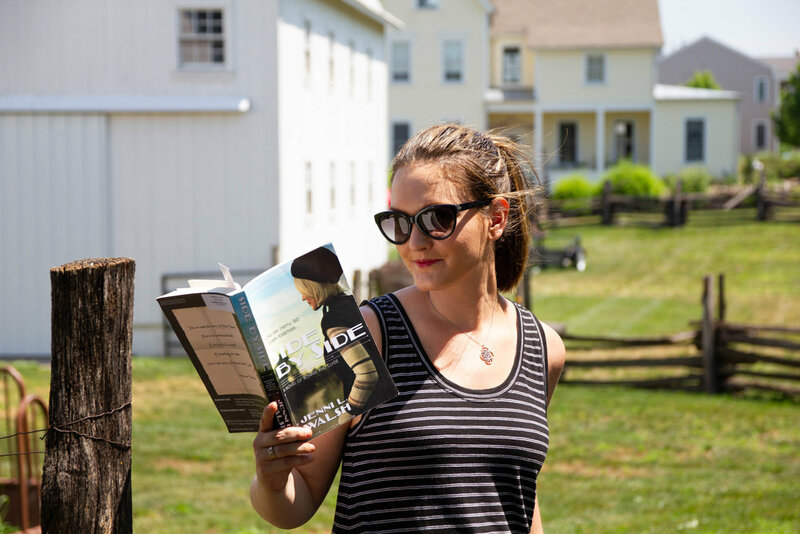 Whereas Becoming Bonnie told the background story of Bonnie Parker before she met Clyde Barrow, Side by Side tells the story of the Barrow Gang and the infamous duo during their crime spree. I know how the story goes, this happened in the 30s, we all know how they meet their end. But I was still on the edge of my seat through each shoot out, bank robbery, or hide out. I love how the story was told from Bonnie's perspective, I love how the author speculated about their motivations behind the crime spree, I love how the reader is compelled to root for Bonnie and Clyde even as they made morally questionable and often morally reprehensible decisions. I did a brief fashion history lesson for the 1920s when I posted my review of Becoming Bonnie so I thought it was appropriate to continue that theme with a fashion history about the 1930s for Side by Side. Bonnie and Clyde's crime spree took place in the early 1930s, particularly from 1932-1934. Of course, this is in the thick of the depression so money was scarce (especially for people like Clyde with a criminal background who are finding it difficult to secure and keep a job.) So many people who just barely getting by and making do - but others weren't as affected by the depression and still the 1930s is often remembered for its old Hollywood glamour, biased cut gowns, and womanly curves! The following four dresses are examples from the Metropolitan Museum of Art all dating to the early 1930s. In comparison to the 1920s looks, notice the waist line that sits at the natural waist (instead of the popular dropped waist of the 1920s), visible hips (instead of the boxy, boyish looks of the 1920s), longer hemlines and more emphasis on the shoulder. Click on any of the examples shown here for more information about the individual garment from the Metropolitan Museum of Art. 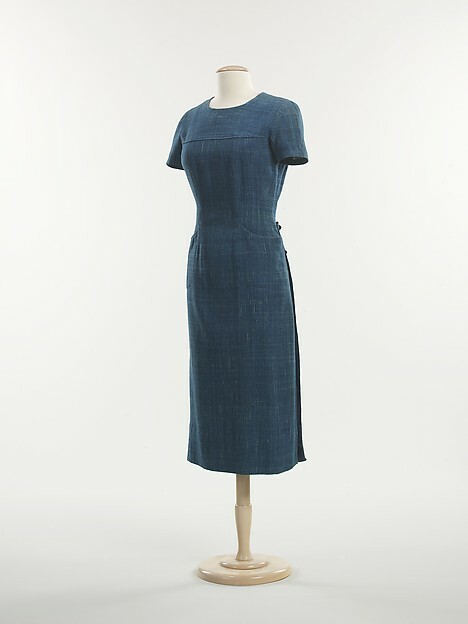 Elsa Schiaparelli, an important designer in the 1930s, designed the blue linen dress. She started her career designing knit wear and sports wear, adding evening gowns in the early 1930s. She's well known for her feud with Coco Chanel and her signature color, Shocking Pink. I'm particularly fond of the red dress, designed by Valentina. Evening gowns in the 1930s often accentuated the back, but this dress has a little peep hole in the front. It also reminds me of a fancier version of the dress Bonnie wore in this cheeky photo of her pointing a gun at Clyde. If Bonnie's fate had taken her in a different direction, I imagine she would have looked amazing in this red Valentina.